"Baseball Hacks" isn't your typical baseball book--it's a book about how to watch, research, and understand baseball. It's an instruction manual for the free baseball databases. It's a cookbook for baseball research. Every part of this book is designed to teach baseball fans how to do something. In short, it's a how-to book--one that will increase your enjoyment and knowledge of the game. So much of the way baseball is played today hinges upon interpreting statistical data. Players are acquired based on their performance in statistical categories that ownership deems most important. Managers make in-game decisions based not on instincts, but on probability - how a particular batter might fare against left-handed pitching, for instance. "Baseball Hacks shows" how easy it is to get data, process it, and use it to truly understand baseball. The book lists a number of sources for current and historical baseball data, and explains how to load it into a database for analysis. It then introduces several powerful statistical tools for understanding data and forecasting results. For the uninitiated baseball fan, author Joseph Adler walks readers through the core statistical categories for hitters (batting average, on-base percentage, etc. ), pitchers (earned run average, strikeout-to-walk ratio, etc. ), and fielders (putouts, errors, etc.). He then extrapolates upon these numbers to examine more advanced data groups like career averages, team stats, season-by-season comparisons, and more. Whether you're a mathematician, scientist, or season-ticket holder to your favorite team, "Baseball Hacks" is sure to have something for you. ""Baseball Hacks" is the best book ever written for understanding and practicing baseball analytics. A must-read for baseball professionals and enthusiasts alike." "The game was born in the 19th century, but the passion for its analysis continues to grow into the 21st. 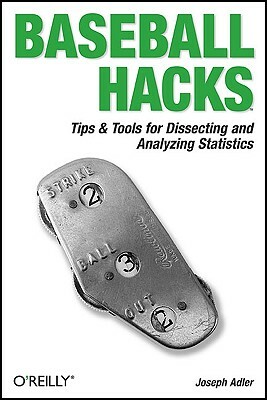 In "Baseball Hacks," Joe Adler not only demonstrates that the latest data-mining technologies have useful application to the study of baseball statistics, he also teaches the reader how to do the analysis himself, arming the dedicated baseball fan with tools to take his understanding of the game to a higher level."